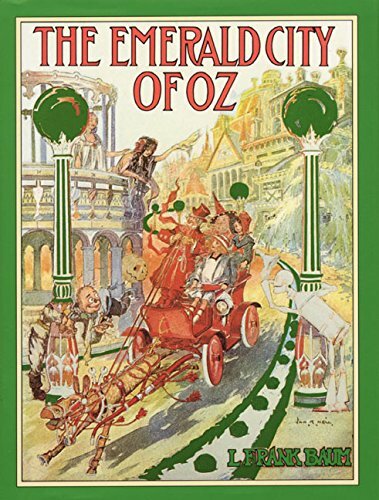 I has been a while since we've had a chance to transport ourselves into fairyland through reading another chapter in The Emerald City of Oz. We are in Chapter 3, right now. You can look through older blog posts to find the discussions on chapter 1 and 2. The great thing about the Internet is that these discussions can go on as long as anyone wants to post a comment. Of Oz-lopedic note in this chapter, we see the term "Ozite" used. This term describes any of the half a million people living in the Land of Oz - at the time this story takes place. Some of whom were not flesh and blood! Some of those who might not have been of flesh and blood could include a group of people called the Hammer-Heads, whose necks are like rubber. They live in the South of the Land of Oz, in the mountains. Also, there are creatures who have the bodies of bears and the heads of tigers that are called the Kalidahs-beasts. And almost certainly of the 'not flesh and blood' category would be the Fighting Trees who have their own forest and a tendency to hurl away intruders! Of Oz-o-Graphic interest, we find that in addition to the well known Munchkin Country, there is also mention of a Winkie Country. I wonder how big a fairyland Winkie is. Do you think they are related to Munchkins? We also learn that the palace housekeeper is named Jellia Jamb. Doesn't she sound sweet? I hope she has help cleaning the palace. Since everyone in Oz works half the time and plays half the time, she must have help. Well, the short side of the Chapter is that Ozma of Oz, the girl Ruler of the fairyland of Oz agrees to bring Aunt Em and Uncle Henry to live with her and Dorothy Gale in the Land of Oz. They are all set to bring them via the magic belt the next morning after breakfast. It is going to be a big surprise. Aunt Em and Uncle Henry are to be brought without any warning. The plan is to then have Dorothy explain anything they don't understand. I'll see you all in Chapter 4! Advertise on the Oz-Stravaganza Website!